1. The hills. 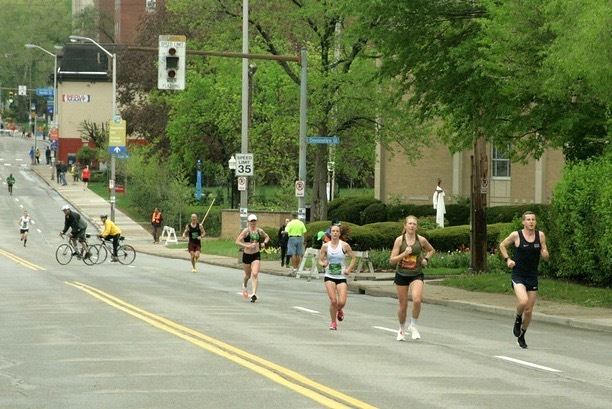 I obviously knew about Pittsburgh’s hills all along and trained for them as best I could. (Was it enough???) I tensed every time someone mentioned them, especially when a few days before the race Gwen Jorgensen (Olympic gold medalist in the triathlon, now committed to the marathon) mentioned how hilly the half marathon course was (which was serving as the US Championships and shared the first 11 miles with the marathon). I considered those first miles to be flat and the hill she mentioned around mile 10 didn't even register on my map. Gwen’s sentiment rekindled my fear of the hills and made me more then a little worried I was being naïve. 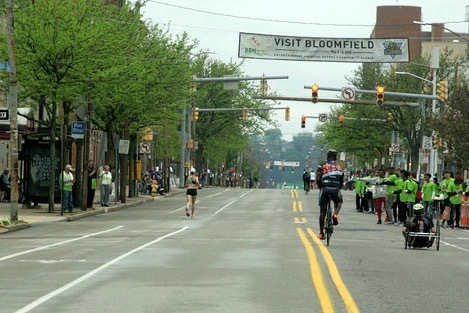 The half marathon splits around mile 11 (before the giant hill). 2. My fitness. 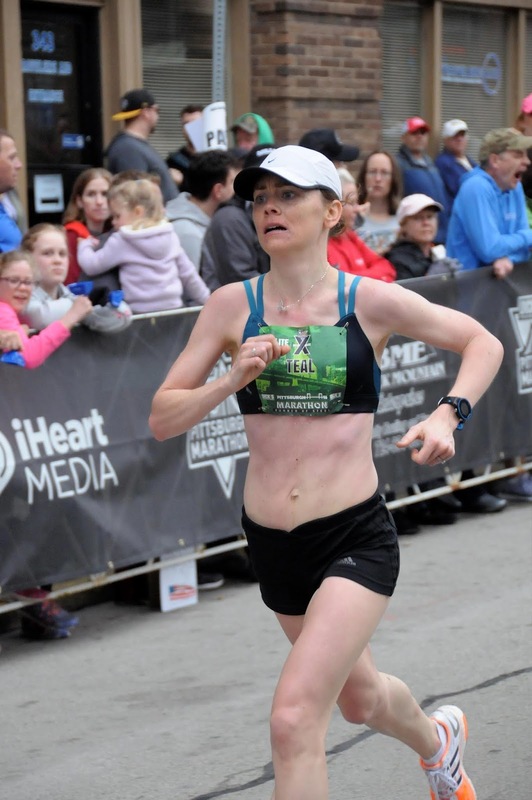 I struggled in crucial marathon pace workouts: could I really run faster and farther than I had in practice? 3. My toughness. I worried that I wouldn’t be tough enough to push as hard as I’d need to in the end. Ever since Baby, I’ve missed my A goals by ten, twenty, thirty seconds. 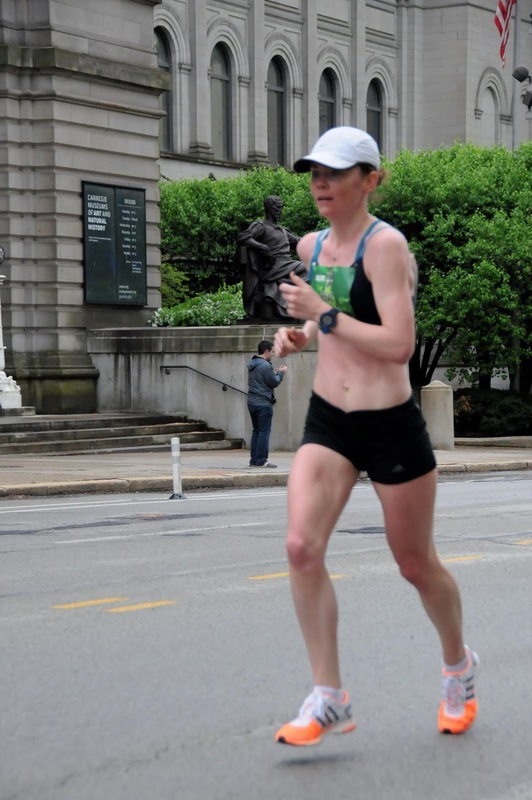 I feared I’d give up on myself (hadn’t I given up during those major workouts?) and that I’d miss it by a hair. I wondered if I lost the grittiness essential to achieving this ambitious of a goal. In the two or three weeks before the race I tried to really hammer the only thing left to hammer: my positivity. I came up with arguments against all those points: I had trained on hills, I had conquered harder ones (I hoped??) in Charlottesville. If I ignored the marathon pace workouts, almost all my other workouts and races pointed to being in similar shape to pre-CIM, where I qualified for the 2016 Trials. And I used to (way back in 2012 and earlier) run faster in races than for marathon pace workouts, even at crazy hilly Charlottesville. Over and over I told myself that I am tough and that when I put these big goals out there, I don’t back down easily. I thought about when I said I’d run sub-3 and did. And when I said I’d qualify for 2016 and did. Sure, I had plenty of examples of goals I set that I did not make, but I was telling myself those were the less important ones. The ones I really cared about, I didn’t give up on. And I reminded myself that I was lucky to be going for this at all. I had originally wanted to run Boston but didn’t have a qualifying time at registration time and wasn’t accepted as an elite. (Which made perfect sense once I saw the depth of the women’s elite field this year!) When Boston turned out to be totally awful miserable weather, I was glad I wasn’t there. I had felt called to Pittsburgh and knew this was God’s plan for me. I was healthy and the weather seemed mostly okay. I had an incredible opportunity that I did not want to waste. As I kept reminding myself these things and reading over my cache of motivational quotes, I was amazed to realize the positivity thing was working. I really started to believe. I’m going to do it. I’m going to qualify. Until Saturday, the day before the race, when everything came crashing down. We had arrived in Pittsburgh the day before and that night Baby had gotten sick. She woke up every hour coughing and sniffling and struggling to go back to sleep. By morning, everyone was tired and cranky and desperate for another shot at rest during nap time. But Baby refused to sleep in the hotel room, so we packed her in the car and drove the course while she slept and I tried to tell myself the hills weren’t so bad. I started worrying I would wake up sick too (I feel a little funny… am I congested? I think I have a sinus headache coming on…), but even more than that I worried this weekend was turning into a disaster. Poor Husband was taking the responsibility for sick Baby, no one was sleeping, we’d driven hours to get here (as had my Dad), and it was likely going to rain on race day, which seemed like a suckier situation for the spectators than me. I have to do well or this whole weekend will be a horrible memory. Race morning I woke up sick-to-my-stomach nervous, like I had the weight of the world on my shoulders. Am I always this nervous??? It was just a race, but it represented months of work, months of sacrifices by people other than me. I have to do this for my family, all my supporters who believe in me. I can’t let them down. Baby was still struggling so no one had slept again, but I reminded myself that I never sleep the night before a marathon. I only ate two thirds of my breakfast I was so nervous, which I don’t think has ever happened before. Once I got to the elite athlete area I sort of calmed down. I wasn’t thinking too much ahead, just going through the motions of what I needed to do (i.e. go pee nine thousand times). The superstars warming up for the US Half Marathon Championships distracted me a bit. At least I don’t have to compete against them. I did have to run twice as far up far larger hills, but whatever. My plan was to run the first half around 6:15 pace. 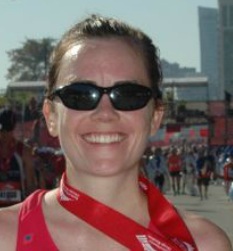 To nab a qualifier, I needed to run under 2:45, or 6:17 pace. 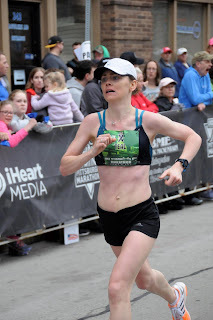 I don’t typically/ever recommend going out fast in a marathon or trying to bank time, but because of the nature of the course (a flat first half and a hilly second one) I figured to have any shot I needed to at least be on pace or slightly ahead for the flat section. Despite my typical strategy of constantly obsessing about over/under (That mile was 3 seconds fast, the one before that was 2 seconds slow, so now I’m 1 second under) I tried my best not to freak out about a second here or there. The first mile was 6:12: A little fast, but that’s okay. Just relax into it. The next was 6:16: Okay, right on. The next few miles were a hair under 6:15 and I tried not to scrutinize every second and just kept telling myself I was running exactly according to plan. With Devon Yanko, around mile 6. We ran the next couple of miles side by side and I was glad to have someone to run with. Maybe I won’t have to run this whole race by myself! Around mile 6, we caught up to another woman and I told her to jump in with us: “We can work together!” I was trying to be nice/desperate for company on this mission, but I’m not sure it came off the way. I wasn’t sure if she happily said, “Good, thanks!” or angrily said, “I’m good, thanks.” Maybe I pissed her off by implying she was in need of help? I self-consciously debated this as we crested a bridge, but she tucked in with us whether I annoyed her or not. I knew we were slowing as we went up the bridge; it was a hill after all, but considering what we had coming, it was a minor one. I reminded myself how great it would be to have company to work with, but when I saw the split (6:25) and thought again how that hill was barely a blip, I couldn’t help but pick up the pace. Suddenly I was alone. Oh man it’s going to be embarrassing if they catch me later. (“Now how about you jump in, you idiot who went out too fast.”) But I trusted sticking to my race plan was my best shot, so it was back to going for 6:15s, alone or not. At mile 8, I got to see Husband and Baby cheering. It was another reminder of all they do for me and how much I wanted to succeed and celebrate with them. So far, things were going well. I’m doing fine. I’m executing my plan. Just stay relaxed and calm and get to the hill. I was running with a couple men and hoped they were running the full so we could work together for a while. But when we split from the half marathoners around mile 11 only one guy was left. I lost even him soon after. Alone again, naturally. 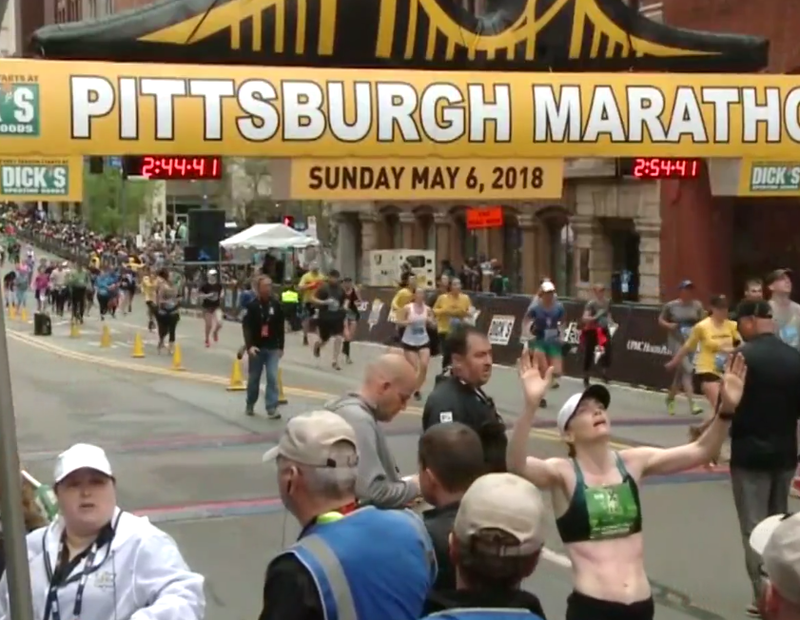 As I crossed the next bridge, I noticed the woman up ahead looked a lot like Clara Santucci, who had won the race in 2014 and 2015 in the low 2:30s. Pre-race press mentioned her as going for the win. Am I really right behind Clara Santucci?! I debated this for a while—maybe it’s someone else, was she wearing white when I saw her at the start?—and soon enough we were over the river and heading up the big hill. When driving the course the day before, I realized the hills weren’t so much steep monsters as long, slow slogs. They weren’t the kind of hills where you’re huffing and puffing and nearly puking at the top, but just where you’re slowing and it’s hard and, man, it sure would be nice if it were flat again. 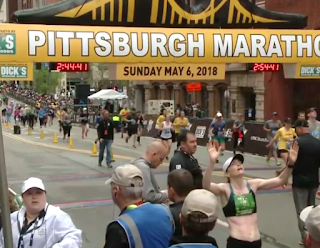 I expected to lose thirty seconds or so, but hoped to put a metaphorical pin in it, just try to run 6:17s, and not worry about the thirty seconds until after mile 20. The course doesn’t go back down that hill until mile 23, so it was important to not freak out about being over pace, but just settle back in and trust the time would be made up later. I didn’t want to stress myself out or overanalyze my pace too early. At mile 20 I’d give myself permission to start pushing. Wait until mile 20: that’s when the race will really start. The top of the hill, mile 13. Trying to catch Clara (white shirt). Mile 14. Somewhere in mile 18 the pace on my watch was hovering in the 6:40s and I was telling myself it must be wrong: the buildings are throwing off the signal. Except we weren’t anywhere near downtown and there weren’t any tall buildings. 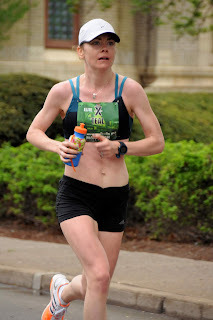 There was a woman up ahead that I had been chasing since about mile 16. She’s not pulling ahead any more so I must not be slowing that badly… Oh but that guy did just blow by me, maybe I am slowing. I reminded myself that the pace often slows in these miles not because you can’t maintain it but because you lose focus. Focus. Get to 20 miles in one piece, then it’s game time. Focused on one mile at a time. Mile 18 was still a little slow. So was 19. Just get to mile 20. 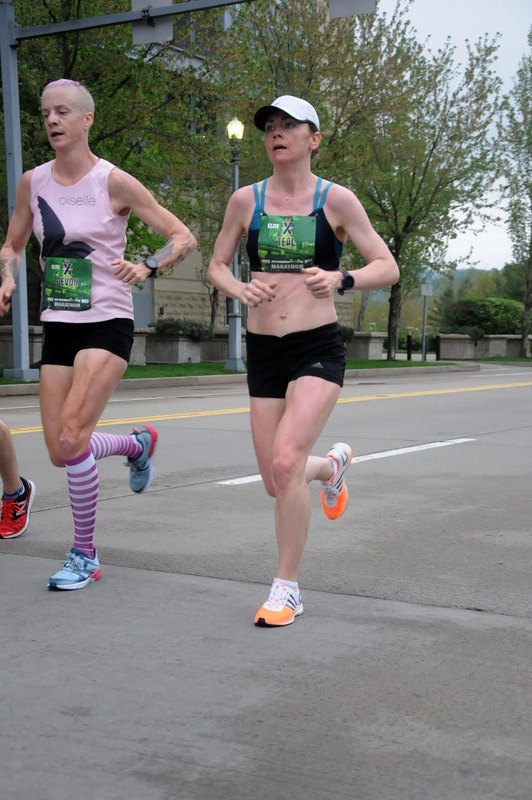 I passed two women in the twentieth mile, but it was another uphill slog. I had memorized the splits I needed to hit for miles 20 and 25; they would serve as my checkpoints. All I cared about was getting to the clock and seeing where I was. Mile 20, 2:06:21: exactly thirty seconds over. Okay, this is what I prepared for. This is what I knew would happen. I need to average 6:10s from here to the finish and I’ve got it. The downhill is still coming, that will help. 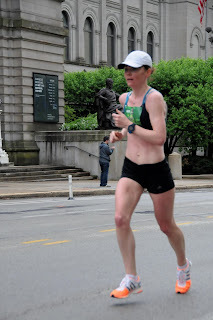 What also helped, though I had no idea at the time, was that I was so busy looking at the clock on the course that I didn’t check my watch split. Mile 20 was a 6:40, the slowest of the day. When I run an unexpectedly slow mile in training, it often derails me. Oh my gosh, I can’t do this, I’m falling apart! And then, inevitably, I do fall apart. Because as soon as you accept that you’re slowing, falling apart, failing, it just snowballs. The doubts were starting, but I was executing my plan. Thirty seconds over at 20 miles is fine. Thirty seconds is doable. Still got the downhill to go. I knew there was one more uphill before that crucial downhill but I couldn’t remember where it was. 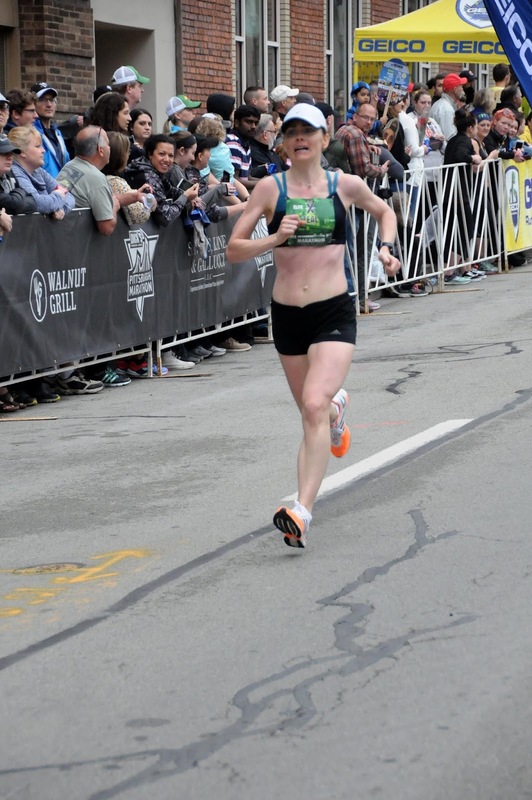 Does the uphill end at mile 22? I made it to the 22-mile marker (a 6:15 mile, gotta push a bit more!) and saw my Dad cheering wildly. I knew by his enthusiasm he understood how close I was. He also said I was in sixth place. That would win me some money, so I tried to use it as motivation. There were no women in sight and I had no idea if any were on my tail but I also wasn’t sure I entirely cared. I no longer worried about being embarrassed if someone caught me. I just wanted that sub-2:45. Mile 22. Fighting my way towards the finish. The demons got louder. And the last uphill had not ended at the mile 22 marker. When does this hill end? Where is this stupid downhill? I’m not going to make it. I’m going to miss it by a hair. But I can’t, I’m not going to do it. I’m going to miss it. I need to run 6:10s and I’m not. Mile 23: 6:17 pace. Another not-6:10. Then, the downhill. Oh sweet mother of God, the downhill. I was flying. Still praying that it was enough. I just let my legs do whatever they could. Go as fast as you can, take every single second you can get. Flying down the hill, the angel gained some ground in his arguments with the devil. The pace on my watch read under 6 minutes. This is what I needed. Thank you, God. I can still do it. Okay, I made up the 30 seconds, I’m back on pace. (I was actually 11 seconds under, but I didn’t know it.) Now I just need to run 6:17s for two miles and I’ve got it. But when the road flattened, the suffer fest resumed. The pace on my watch hovered in the mid to high 6:20s. And suddenly that stupid devil was back in the lead. Well, you’re not going to make it. You have to accept it. You’re going to miss it by a couple seconds. You’ll have to find a way to get over it. I knew I had more in me; I just couldn’t seem to tap it. Yea, I’m tired, yea, my feet hurt, but this is it. (“If you had one shot, one opportunity, to seize everything you ever wanted…”) There’s more there, c’mon. Still my pace was stuck in the 6:20s. There was a fluid station around mile 24. At that point, I was (hopefully) going to finish this thing before any Gatorade would actually make its way to my muscles, but studies have shown that just swishing Gatorade in your mouth tricks your brain into thinking fuel is coming, so it lets you speed up. I grabbed a cup, squished some around and tried to spit it out. But my capabilities were so limited at that point the Gatorade instead just dribbled out of my mouth and down my front, like I was a baby who didn’t yet know how to eat or drink. I must have been some kind of sight: muttering prayers to myself as I foamed at the mouth. I have to do this for Baby, for Husband, for all they’ve put up with this weekend, this whole season. I want to celebrate with them, not wallow. I HAVE to make it. I was desperate to get to mile 25, the other split I had memorized to see where I was. Oh my God, I can still make it. It’s not over. One more mile, push push push. I still felt like I had more but couldn’t tap it. C’mon, do it for your family. I knew this and was reminding myself I had science on my side. There’s more there. But still, I was not speeding up. Oh my God, I’m going to miss it. I have zero seconds to spare. C’mon God, give me something. Help me go faster. I don’t know at what point that prayer was answered, maybe when I finally could see the 26-mile marker, when my brain finally let up the emergency break. All of a sudden I was all-out sprinting. I have to do this, I can make it. Sprint sprint sprint. Husband was cheering wildly in this stretch and I knew from his voice he knew how close I was. He said later that he’d never seen me like that, never seen that kind of a sprint from me or that look in my eyes. “Desperation and I would even say fear,” he said. Uh yeah, I’d say fear too. I was scared out of my freaking mind. C’mon, everything you’ve got, for Husband, for Baby. This. Is. It. The turn for the finish comes just after the 26-mile marker and I could finally see the clock, but I couldn’t make out the numbers. Oh God, please don’t say 2:45. Please say low 2:44. Still sprinting, still praying. Does it say 2:44:50 something?! Oh my God, I’m going to miss it. Willing the clock to have enough time left. No, no! It says 2:44:20 something. Oh my God, I’m going to make it! I did not let up until I was under the banner and the clock and then, OH THANK YOU GOD, we did it. 2:44:36. An Olympic Trials qualifier and sixth place. 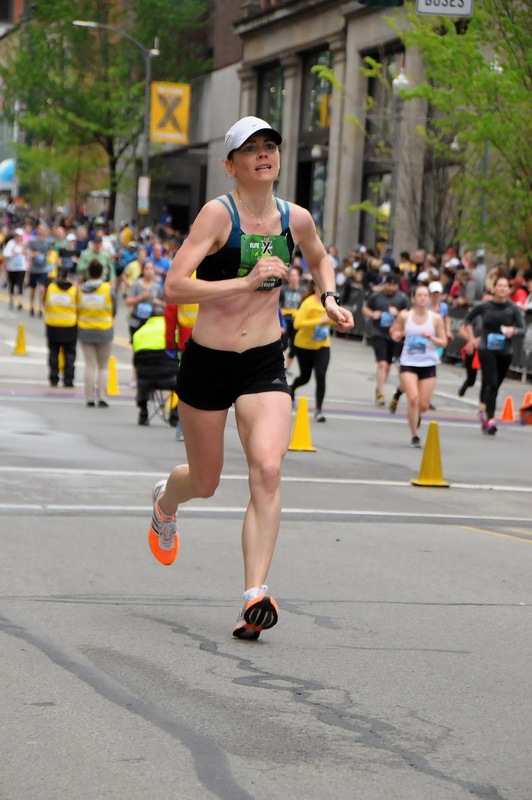 I didn’t break down in tears like at CIM, because I was so gutted I could barely celebrate. By the time I got through the crowded finisher’s chute (the half was finishing too) and realized I had walked a few blocks past the elite tent, I felt so sick I had to sit down. I convinced a police officer to let me out of the barriers so I could sit on the curb but he in turn convinced me to go to the medical tent, which I accepted mostly so I could get a ride back towards the elite tent. I knew I was fine, just depleted, and the doctors confirmed that. I finally made it to the elite tent but I still could not wrap my mind around it. Did I really make it?? Even days later, it doesn’t seem real. I knew it would be a dramatic fight to the finish and I would have to be relentless in those final miles. But for all my pre-race talk about belief, now that I've done it... I can’t quite believe it.